A really thorough examination of the military position of Scotland both before and during the reign of James IV, and a detailed description of the Flodden campaign. 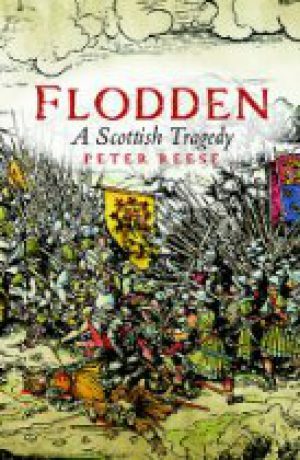 This book sets the campaign of Flodden in its military context, as much as its political one. The first section of the book outlines the progress of the endless border campaigns fought between Scotland and England and the military issues that decided the outcome of each. Essentially, England could command more money, more arms and more men, but Scottish resistance was fierce, and, provided the Scots could wait a long invasion out, they could eventually repel the English. England, although richer, had neither the resources, nor the sustained will to permanently conquer and settle its northern neighbour. The Scottish Kings played a dangerous game. As well as repelling English invasions, they often had an eye to extending the border south, claiming the ancient kingdom of Northumbria was subject to the Scots Crown. The prize most bitterly fought over was Berwick, which, although originally Scots, changed hands some thirteen times in all. In the 1460s it was ceded to Scotland by Marguerite of Anjou, the Lancastrian Queen, in return for troops, but was grabbed back a final time by Richard, Duke of Gloucester (later Richard III). Reese then moves on to the events of James IV’s reign and his relationship with Henry VII, the final victor in the Wars of the Roses and his flamboyant son, James’ brother-in-law, Henry VIII. James IV’s development of artillery and the effective use of cannon in suppressing the early rebellions of his realm are touched on, then the very effective campaign of 1497. This provoked a more aggressive response than James had, perhaps, anticipated and it was lucky for James that Henry was diverted by the Cornish rising. Following the 1497 campaign, and the eventual Truce of Ayton, war between the countries was ceased, in principle at least, although low level border incursions continued. This period of peace was seized on by James to increase Scottish naval capability, and Reese looks at this in some depth. Reese asks the interesting question of whether James’ success in the early part of his reign led him to believe that his military strength was greater than was actually the case. He also points out that some of James’ expenditure on his trophy ships might have been better spent on a fund for paying soldiers’ wages, or mercenaries, to allow him to raise an army that was both larger, and longer-lasting than reliance on the feudal levies. James was, however, a mediaeval king and thought in terms of military service, rather than a paid army. We then come to the deterioration of relations between the two countries in the period 1509 – 1513. Reese explores the sometimes similar, sometimes competing, characters of James IV and Henry VIII, and the effect their outlook and personalities had on political and military matters. He also looks at the battle of Flodden in the context of wider European issues. In his concentration on military matters, Reese does not always examine some of the political nuances that other writers consider in more detail, but he does look at the importance of military success to both kings, but particularly James, in preserving their positions in a society that fundamentally considered success in battle as the most important element of kingship. Reese's real contribution is the detailed analysis of the battle preparations, the different methods raising of troops and how they were supplied and paid, the relative merits of the various weapons that the two armies deployed, the skill and experience of the commanders, and finally, the battle itself. A comprehensive and readable account of a battle that had a major effect on the history of the British Isles.